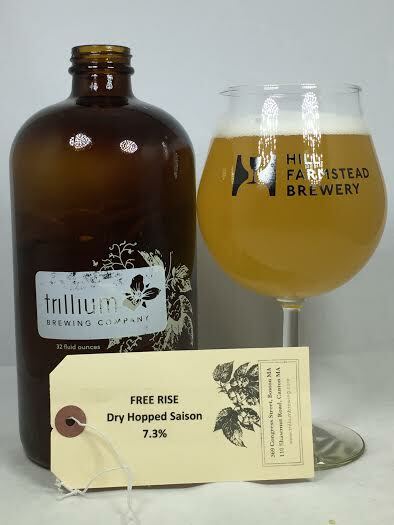 "The first saison brewed at our new Canton facility, Free Rise highlights locally sourced Danko Rye from Valley Malt and Citra in the dry hop. A floral, citrus hop profile is balanced with subtle, nutty malt character and a delicate black pepper spice. Light in body, with a clean, bone-dry finish, Free Rise is a welcomed addition to our family of farmhouse ales." Pours a darker shade of straw yellow with two fingers of pure, white head. Distinct Saison aroma of hay, sawdust, and funk with a noticeable orange zest for a fruity kick. In my limited time with Trillium Saisons I have come to feel that they taste sweeter than your average example of the style and this is no different. I think that Danko Rye that Trillium loves to use is cutting into the typical Saison characteristics and providing the sweetness. Still, the funk and barnyard taste is huge with a fresh-cut cedar flavor and a black pepper feeling that a lot of great Saisons tend to have. There's definitely a dry, doughy taste which I will attribute to the rye along with a light pilsner component and the Citra dry-hopping is very (VERY) subtle, but I do pick out a little bit of lemon zest and orange rind. Mouthfeel is noticeably dry, but also incredibly light for a big (by Saison standards) 7.3%. That funk stays for days (points for the rhyme), but despite the abv, I can see myself enjoying this on a hot summer's day because it is pretty refreshing. A lack of carbonation needs to be mentioned, but it doesn't take away from the experience. Free Rise was mostly on point for the typical Saison characteristics, which makes it enjoyable for the style. I guess I could have expected a bit more citrus from a self-described Citra dry-hopped beer, but it wasn't completely devoid of any orange flavor. Still, this was a damn good Saison with high levels of drinkability for over 7% thanks to a light body and delicious flavors.